The world's most dangerous central banker is scheduled to unleash more financial mayhem tomorrow. But there is only one possible result from Mario Draghi's plan to drive the ECB deposit rate deeper into ZIRP-land from an already absurd level of -0.2%. Namely, it will cause a whoosh of short-term flows out of the euro, thereby driving the EUR exchange rate downward against the dollar and other major currencies. That used to be called beggar-thy-neighbor. And it still is. There you have it, and there ain't no more. The whole drama scheduled for tomorrow at the ECB is about nothing more than plunging deeper into crank economics and the age-old fallacy that nations can make themselves wealthier by trashing their own currency. At this particular juncture, however, we have reached a remarkable threshold. The ECB is the legatee of the stoutly anti-inflationist tradition of the German Bundesbank. Yet in a few short years a foolish former Italian Treasury bureaucrat, and one-time Goldman Sachs trainee, has turned the ECB upside-down-------morphing it into a desperate engine of inflation, and for no rational or plausible reason whatsoever. Yes, the eurozone CPI has come in at a 0.2% increase over the past year, and as a matter of arithmetic that's 180 basis points below the ECB's vaunted 2% target. So what! There is not one iota of proof anywhere that on a sustained basis 2.0% inflation is better for prosperity than 0.2% inflation. This endlessly repeated policy mantra is just central banker ritual incantation. Besides that, what's wrong with a brief spell of flattish CPI readings when they are self-evidently a result of plunging global oil and commodity prices? Any fool can see that Europe has not suffered on a trend basis from anything that remotely resembles deflation. In fact, its 5-year CPI rate is 1.5% per annum and it's 2.2% since the turn of the century. The recent dip is just that-------a cyclical plunge that is being imported on ships laden with oil, copper, petrochemical feedstocks and an array of imported intermediate and manufactured goods. The chart below has absolutely nothing to do with any kind of structural malady in the European economy or financial disorder that the ECB can cure with the action contemplated for Thursday. To wit, this ship of fools plans to lower the ECB deposit rate from -0.2% to -0.3% or possibly -0.35% if they can muster a show of special resolve. For crying out loud, the claim that such a rounding error change has anything to do with the embedded inflation cycle shown below is just plain blithering idiocy. It amounts to monetary shamanism, not rational economics. The truth of the matter is that the ECB has become just another central bank contestant in a race to the currency bottom-----an exceedingly foolish endeavor they launched in response to the global deflation now underway. Yet that baleful condition exists for reasons that our Keynesian central bankers cannot remotely grasp. That is, the world is experiencing an inexorable "payback" cycle after 20 years of reckless credit expansion that was caused by radical money printing central bankers. During that period, total credit outstanding in the world soared from $40 trillion to $225 trillion------an astounding explosion of debt that amounted to 4.5X the gain in world GDP during the same period. Needless to say, the Eurozone fully participated in the party, and that's why Draghi's plunge into N-ZIRP policies is especially stupid. In addition to purportedly stoking consumer inflation, negative interest rates are supposed to encourage more lending to businesses and households, thereby exciting the virtuous expansion cycle of the Keynesian textbooks. Here's the thing. It doesn't work when an economy is already at peak debt. Under that condition, central banks end up pushing on a limp credit string, causing massive distortions in financial markets without generating any increase in borrowing and spending on the main street economy at all. That's where the eurozone is. Between the launch of the single currency in 1998 and the 2008 financial crisis, credit extensions to Europe's already debt-laden businesses and households soared at a 9% annual rate. Yet it has plateaued since then not because credit was too expensive or interest rates were too high. The reason is that private sector borrowers are tapped out. The central bankers' parlor trick of ratcheting-up the private sector leverage ratio doesn't work anymore-----even when private savers are crushed and interest rates are driven below the zero bound. 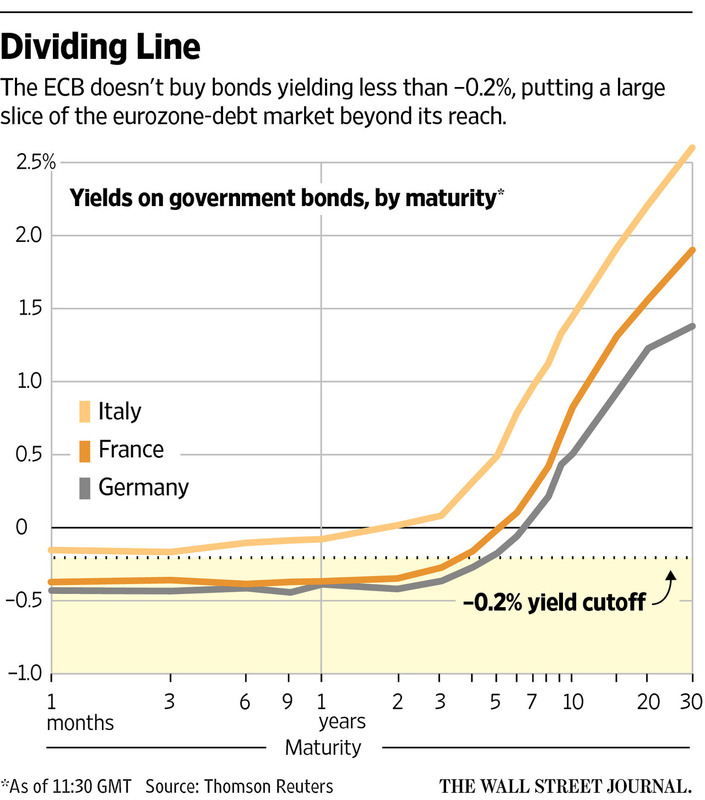 What ZIRP has done, however, is accelerate Europe's headlong rush toward fiscal bankruptcy. After all, the socialist politicians of Europe can scarcely imagine a world in which their out of control welfare states are curtailed. But when the carry cost of debt is practically nothing, the thought does not even cross their minds. Yes, they have been warned by a few academic scribblers that when public debt reaches 100% of GDP a future fiscal crisis is almost inevitable----and especially in nations which are aging rapidly, as is almost all of Europe. But as shown below, the Eurozone will cross that 100% threshold and then some at the very next recessionary downturn in the world economy-----a prospect that is not very far around the corner. There is simply nothing more foolish imaginable than for central bankers to tempt elected politicians with negative cost of carry on the public debt. That is, to so distort and mangle financial asset markets that hapless money managers feel compelled to pay governments for the privilege of loaning them money. As shown in the graph below, that's exactly where the eurozone is today. In fact, to even adhere to its current $68 billion per month bond buying plan it will soon be engaging in one of the most stupid financial arbitrages ever conceived. That is, the ECB will be buying bonds from banks which have a lower negative yield than the negative deposit rates banks will be paying to the ECB on the newly minted credits which fund its QE purchases. In short, Draghi & Co. will lose money printing money! Once upon a time, the Germans would surely have labeled such an absurdity as the work of an outright monetary "dummkopf". Hopefully, they will call out the one in their midst tomorrow.